Mirjana Margetic is a mid career, Melbourne/Geelong –based interdisciplinary artist working in sculpture, installation and painting. 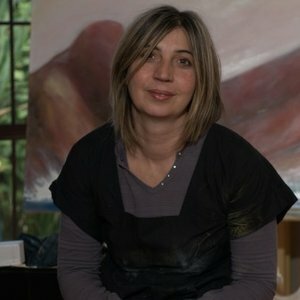 She is a graduate of Ballarat University, Fine Arts (2008) having studied painting, sculpture, drawing and printmaking. Since completing her degree, Mirjana has been continually creating and exhibiting her works, that range across drawing, painting, mixed media and installation. She has been included in numerous group exhibitions and has held 6 solo exhibitions in various places. Mirjana has also worked in collaborations that include writing, community education, as well as community driven projects. The notions and transformation of cultural identity are intrinsically linked to Mirjana’s artwork. Mirjana’s most recent art practice exploits found objects (cultural artefacts in the form of cloth) as a painting material. Mixed media works embrace embellishment and a plethora of unconventional artistic materials that she uses to investigate and speak about immigration and identities. Further, her great interest lies in exploring the concept of human impact on the environment by redefining Australian landscape through assembling found objects to create sculptures.